The rooms were decorated, furnished and equipped with everything you would expect of a 5 star hotel. Every room is adorned with touches of modern look, and designed to make you feel right at home—they even come equipped with high-speed internet access. The Cavinton Hotel Yogyakarta offers a wide array of dining options, be it for quiet conversations with friends and family or grand banquets. The Shambala restaurant features a delightful a wide variety of Indonesian cuisine including our signature breakfast menu, the best from local taste - all within a lively and stylish ambience. You can also enjoy the open-air shambhala terrace, that has view to the pool. 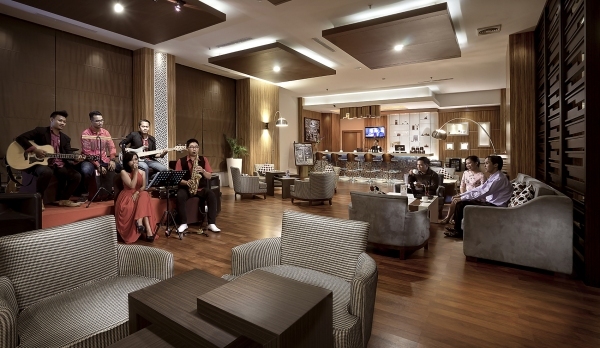 and Amartha Coffee Lounge are perfect for entertaining with their gorgeous selection of indonesian coffee. Enjoy the calming chill-out live acoustic and signature beverages whilst surfing the net with complimentary Wi-Fi Internet access. Discover Yogyakarta from “Malioboro Sky Lounge” as venue to relax and experience breathtaking panoramic views of beautiful Mount Merapi and Yogyakarta city. Situated at the rooftop of Cavinton Hotel Yogyakarta, an open-air offers a lovely ambience and commands one of the most mesmerizing views of Yogyakarta city skyline. It will be an unforgettable experience with the atmospheric setting that is heightened by nightly views of the city. One of the best things about Cavinton Hotel is the location. You’re right in downtown next to the Malioboro shopping district as tourist area, Royal Palace complex, and easy access to Adisucipto International airport Yogyakarta and the Tugu Railway Station.